Use a teaspoon to scoop the seeds and pulp out of the inside of the squash rings. Discard; set rings aside. In a food processor, pulse together the almond flour, coconut flakes, sea salt, and onion powder (if you don’t have a food processor, just double the almond flour and stir all of the ingredients together well). 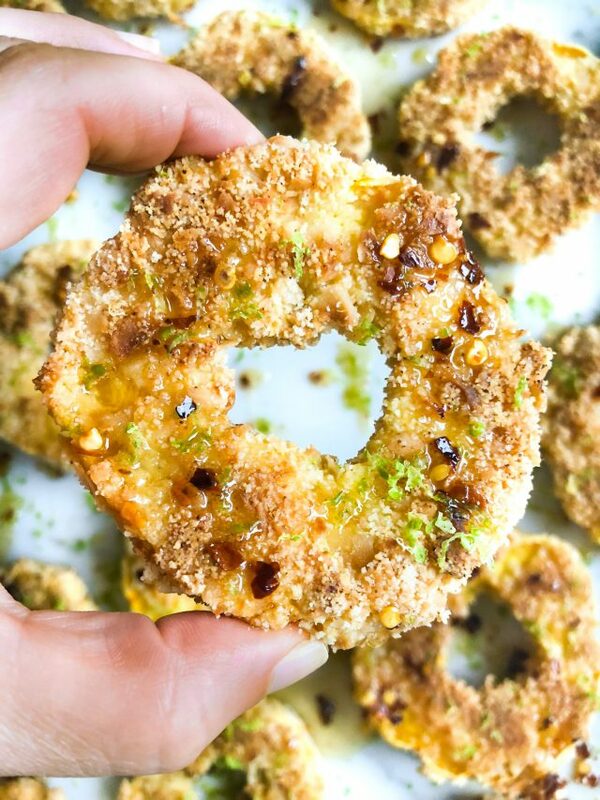 Dip squash ring in egg, then dip in almond flour mixture, patting to make sure each squash ring is well covered. Lay on prepared pan so the rings aren’t touching each other. Continue until all rings are coated in almond flour mixture. If you have olive oil spray, spray the rings (if you don’t, no worries—just skip this step). Place in the oven. Cook until bottoms are golden-brown, about 30 minutes. Meanwhile, gently heat maple syrup and red pepper flakes over low in a small pot. Bring just to simmer, then remove from heat. To serve, drizzle squash rings with maple syrup/red pepper flake mixture, then zest on some lime and squeeze with a bit of juice.